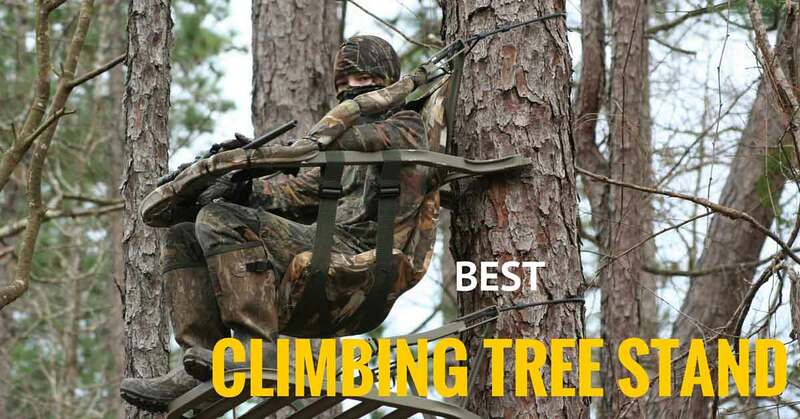 →The 5 Best Climbing Tree Stands To Bag That Buck! Hunting is a trial of patience, skill, and preparation. If you’re not prepared, you’re setting yourself up for failure. Because of this, it’s essential to buy the best gear possible. One piece of gear that you can’t skip out on is a good tree stand. But what’s the best climbing tree stand to buy? And why should you invest in one? What’s The﻿﻿ Best Type Of Tree Stand? ​Tree stands are synonymous with hunting. They’re an important tool that often impacts whether a hunt is a success or a flop. When used properly, you’ll be invisible to any animals. Your increased vantage point will help you spot your prey and stay out of site. You’ll be able to lure them close using different types of traps, calls, and scents. Tree stands let you control the flow of your hunt. While it’s possible to go hunting without a tree stand, it’s often not recommended. Using a tree stand is a great way to increase your odds of bagging a kill, especially if you’re a novice hunter. They let you observe the location while hunting and let you relax while doing so. You won’t be on your feet all day long, tracking your prey and they can make your trip a more enjoyable experience. We know many hunters that swear by tree stands. Many admit they wouldn’t be half as successful as they are if they didn’t use one. Like any other piece of hunting gear, they’re a tool and don’t guarantee you a kill. But when used in conjuncture with the right gun, bait, and location, you can greatly increase your odds of success. ​Still, while many hunters swear by tree stands, there are some who vow to never use them. They say it actually makes it harder to shoot whatever it is you’re hunting. Why is this? Some claim that animals, such as deer, are easily spooked and will avoid an area for days afterward. If you’re using a tree stand, this can be a problem, especially if it’s a permanent one. Some hunters say you’ll have better luck hunting on the ground and tracking the animals by foot. While some of these hunters may be right, it’s up to you to make the decision yourself. How can you remedy this problem of scaring away your game? To begin with, you’ll want to be as quiet as possible, all the time. Animals get spooked at foreign sounds, so the quieter you are, the better. Be careful while moving, especially while setting up your tree stand. Mask your scent using sprays. Don’t make sudden movements and be sure to set your tree stand up out of the animal’s line of sight. If you do this correctly, the chances of the animal seeing you fall significantly. A shot may cause your chosen animal to avoid the area for days afterward. Be sure to take careful consideration when taking a shot. If you don’t see prey in one location, it may be worthwhile to move to a new one. ​When looking to buy a tree stand, there are some important things to look for. The first thing to keep an eye out for is the type of tree stand you’re looking to buy. They come in many varieties, but the most common is the climbing tree stand. If you’ve never seen one in action. check out the video for more information. This shows you how to set up your tree stand. Other varieties include ladder tree stands, hang-on tree stands, and sling type tree stands. Each appeals to a different type of hunter. Recognize what you’ll be using your tree stand for. Lightweight tree stands are less durable, but easier to move in and out of a location, especially if you’re on public land. If you’re hunting on land you own, a more durable and heavy tree stand is a safe investment. The next thing to keep in mind is the weight of the tree stand. This ties back to how you’ll be using your tree stand. Next, be sure to see how durable your chosen tree stand is. Heavier materials will often be more durable, but this is not always the case. It’s important to find out how well put together the tree stand is. A frame made of steel is useless if the joints are weak and break, for instance. Likewise, cheaper materials put together well may last a long time. Since you’ll be spending a great deal of time in it, it’s important to choose one that’s comfortable. Hunting can be a rewarding experience, or it can be a letdown. There’s no reason to make your trip that much worse by being uncomfortable the entire time. What’s The Best Type Of Tree Stand? So, is there a best type of tree stand? Hunters will give you a variety of answers, but climbing tree stands are always a favorite choice. They’re lightweight, portable, and easy to set up and take down when you get the hang of them. They’re often more comfortable than some other types, too. They may not be the best choice for a permanent tree stand, but they’re the best all-around tree stand on the market. ​This is the perfect tree stand for hunters that have to hunt on public lands. It’s lightweight, portable, and is easy to carry, even over long distances. Despite its small size, this tree stand has everything you’re looking for. If you’re looking for a nonpermanent tree stand, the Hand Climber Combo II is hard to beat. The Viper Classic tree stand is a classic. It’s made of sturdy steel, so you know it’s durable and will never fail you while out in the field. It doesn’t sacrifice safety, comfort, or durability to make an excellent and reasonably priced tree stand. It’s durable enough to leave out permanently and portable enough to carry wherever you need to go. The Viper SD is an excellent choice. It’s strong, durable, and above all, lightweight. It’s perfect for hunters that want everything in a light package: it’s durable enough to be left out as a permanent tree stand while being lightweight enough to carry day after day. It’s a quality product that’s going to last a long time, no matter how you use it. Comfort is also one of the major selling points of the Viper SD – be sure not to fall asleep and miss your prey! If you’re a hunter on a budget, the Multi Vision Steel should be one of your top choices. It’s cheap enough that you can save a considerable chunk of cash while still boasting impressive qualities. It has a few drawbacks, but they’re not deal breakers. If you’re willing to sacrifice a few luxuries to save your money, then the Multi Vision Steel is right up your alley. If you’re really on a budget, the Deluxe Hunting Climber Tree Stand is what you want. It’s heavy and made of some lower quality materials, but it’s still durable, safe, and another smart choice. Plus, with a little bit of elbow grease, it’s possible to upgrade this tree stand to a truly outstanding piece of equipment while still remaining cheaper than other models. Features a full body restraint harness – once you’re in this, you’re not going anywhere! These five tree stands are all great choices for the best climbing tree stand on the market. But which is best? In our opinion, the Summit Treestands Viper SD Climbing Treestand is your best bet. It’s lightweight, but doesn’t skimp on safety or comfort to make it so. It’s easy to carry out to your chosen hunting spot, and even easier to set up! It’s designed to make your life hunting more enjoyable, and it succeeds on all fronts. Using the Dead Metal technology and a fresh coat of camouflage, your prey is sure to never know you’re there. While it’s a bit pricier than other models, it’s worth every penny. Your only worry about the Viper SD is getting too comfortable and falling asleep while in your stand. Besides needing a new coat of paint, there isn’t a downside to buying the Viper SD. It meets the needs of every type of hunter. It’s lightweight, portable, strong, comfortable, easy to set up, and it’s safe. While not as durable as some steel framed tree stands, your stand will last for years with proper care. If you’re ready to jump start your hunting career, look no further than the Viper SD.